Bishop Hồ Ngọc Cẩn was born Hồ Ngọc Ca on December 3, 1876 at Ba Châu, Hương Trà, Thừa Thiên province. He was one of two sons born to Joseph Hồ Ngọc Trí and Anna Nguyễn Thị Đào. Hồ Ngọc Vịnh was his younger brother. Bishop Hồ attended An Ninh Minor Seminary from 1889 to 1896 and Phú Xuân Major Seminary from 1896 to 1902. He was ordained a priest on December 20, 1902. After ordination, he was appointed an Assistant to Rev. Gibert Qúy from 1903 to 1907, later in 1907 Assistant to Rev. Antoine Nhiệm. The second assignment lasted less than a year. He was made pastor and and served Kẻ Hạc Parish for three years (1907-1910). Afterward he joined the faculty of An Ninh Minor Seminary (1910 – 1925). His episcopal ordination was held at Phú Cam Church on June 29, 1935. His Coat-of-arms bore this motto: “In Omni Patientia et Doctrina” which means “In everything Patience and Doctrine.” He was second Vietnamese named a Bishop after Bishop Nguyễn Ba Tòng. After only one year as Coadjutor Bishop, he succeeded Bishop Trung as Diocese Bishop of Bùi Chu for a period 12 years, from 1936 to 1948. He died in Bùi Chu on November 27, 1948, at the age of 72. As a pastor, Bishop Hồ was dedicated to this offĩce through teaching, guidance and evangelization. His holiness and dedication channeled themselves through many pastoral letter, books and apostolic establishments. He wrote about one hundred books dealing with culture and religion. He was endowed with an unusual intelligence. With the zeal of a good pastor, Bishop Hồ initiated many reforms in the whole diocese. He said,”Agood shepherd is always in search of green pasture for his sheep.”( Đức Cha Hồ Ngọc Cẩn Giám Muc Bùi Chu. 1990. page 60. By Rev. Phạm Châu Diên ) Under his guidance, the structure and administration of his diocese underwent many changes. The seminaries were reorganized. He initiated reforms in the lives of priests and religious. The life of the laity was effected too by his reform programs in catechism, liturgy, evangelization, Catholic associations and societies as well as Catholic social and cultural endeavors. Bishop Hồ’s enthusiasm for the renewal of the whole diocese gave birth to the Congregation of the Daughters of Our Lady of the Holy Rosary. When he came the Ordinary of the diocese, there were already several groups of women religious who had : inded together for the apostolic work of the local church. These included the Lovers of the Holy Cross and the members of the Third Order of St. Dominic. These groups were not recognized then as religious orders. Besides, there were other groups of religious sent the diocese with special ministries, such as the Carmelites, Daughters of St. Paul,christian Brothers. But Bishop Hồ still wanted to have a diocesan congregation for women so that they could devote their lives to God through a religious life recognized by the Church. As a member of the Indo-China Council, on one hand he advised major reforms to different religious groups in his diocese to make way for their recognition as a religious order, and on the other hand he prepared the groundwork for a new congregation. In 1940, he sent a letter to Rome asking for permission to establish a religious order. His application was lost due the Second World War. The second time he got a response from the Holy See that allowed him to establish a religious order with simple vows for women that would be called Daughters of Our Lady of The Holy Rosary. 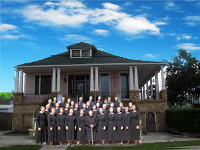 The convent at Trung Linh was chosen to be the motherhouse of the new religious order. On September 8, 1946, The Birth of Mary, Bishop Hồ offìcially announced the Holy see’s approval of the establishment of the Congregation of the Daughters of Our Lady of The Holy Rosary. Naturally, Our Lady of The Holy Rosary is the patron of the congregation. The feast is celebrated annually on October 7. The special purpose of this new congregation is to preach the Gospel through various ministries of the local Church. Because this is the íĩrst congregation that was canonically established in the diocese, it was a new phenomenon which created opposition and invited in a lot of ways negative criticism against the Founder and the Sisters. 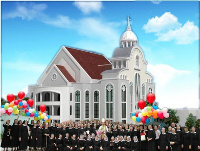 But with a strong faith beautiful manifested through the Founder’s motto, “In ommi patientia,” the congregation has been in being for 70 years (1946-1993), surviving many difficulties and adversaries; and in God’s providential love and care, it is steadily progressing.